This article is the first in a series on Radio Astronomy. To view the second article: second radio astronomy article. It is surprising to many people that radio astronomy does not entail listening for ET to phone home. SETI, (the search for extraterrestrial intelligence), represents a relatively tiny portion of radio astronomy. It would seem that the public perception of radio astronomy conjures up images of astronomers in tight jeans wearing headphones to detect some weak signal buried in the galactic noise. If we apply a brief reality check, we find that radio astronomy is much like optical astronomy, in that telescopes (instruments that detect, image and magnify) are used to observe the cosmos. The difference is that while optical telescopes present images that are familiar in composition (i.e. they present images at frequencies which we can directly see), radio telescopes observe the cosmos at much lower frequencies. Most of us have seen the stunning images acquired by the Hubble Space Telescope. To be sure these images not only give us a glimpse of the wonders of the universe, but move us in spirit by generating a sense of awe. Unfortunately, the primary sensory input device for us humans (our eyes) is very limited in "bandwidth" (the span of electromagnetic frequencies, or 'colours', to which it is sensitive) and while the images move us, they do not give up their secrets easily. As a consequence, much of what is happening in the universe is hidden from our view. To put it simply, each colour is a different frequency, and most of the colour pallet with which the cosmos is painted is invisible to our eyes. It only makes sense to expand our sensitivity, through instrumentation, to the other frequencies in the electromagnetic spectrum. The radio telescope is one of these instruments. It allows us to observe and image the universe at frequencies below our visual abilities which in turn reveals much of what is going on in the universe. Because certain radio frequencies pass effortlessly through pesky dust and gas clouds, we can now study objects heretofore blocked from our view. Also, since certain gases, molecules, and materials in the universe either absorb or emit 'light' at radio frequencies, these structures can be directly viewed by the radio telescope. This ability not only allows the observer to image these objects but also allows the observer to gather much more information such as composition, velocity, temperature and mass. The span of frequencies that makes up the radio spectrum is immense, thus the variety and types of instruments that make up radio telescopes is varied in design, size, and configuration. Lower frequency (10 MHz - 100 MHz - wavelengths of 30 metres to 3 metres) instruments are generally arrays of antennas similar to "TV antennas" or are stationary reflectors of gigantic proportions with moveable focal points; some are over 30 meters high by 500 metres wide. 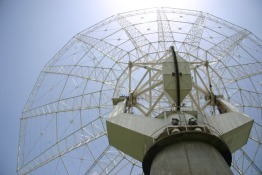 At higher frequencies (100 MHz to 1GHz - wavelengths of 3 meters to 30 cm), very large parabolic or spherical reflectors are used, such as the large spherical "Dish" at Arecibo, Puerto Rico. At frequencies of 1 GHz to 10 GHz (wavelengths of 30 cm to 30 mm), medium to large parabolic reflectors are used 5 to 90 metres in diameter. These reflectors are fully articulated and can observe any object simply by pointing the reflector. For frequencies above 10 GHz (wavelengths of 30 mm to .3 mm), high-precision parabolic reflectors are necessary, typically 3 to 20 metres in diameter. The reflectors are more like mirrors and are thermally stable as well as supported by complex structures since the surface curvature is held to demanding standards. The surface tolerances of these reflectors are held to plus or minus one hundredth of a millimetre for radio telescopes operating in the millimetre to sub-millimetre wavelength region. Each type of instrument opens a new set of "colours" with which for the astronomer may view the universe. Optical telescopes give such clear images since the wavelength of visible light is so small in relation to the diameter of the focusing device (mirror or lens). Radio waves having enormous wavelengths by comparison do not focus into neat "pictures", rather they tend to interfere with one another since the focusing device (reflector) is tiny in relation to the wavelength. To construct a 10 mm wavelength radio telescope with the imaging capabilities of a small 4-inch optical telescope, one would need a reflector about 2 km (over 6000 feet!) in diameter; clearly this enormous size is impractical. It might seem at first glance that radio astronomy would be doomed to low-detail observations and rather dull data gathering tasks. The fact that light and radio waves tend to interfere with one another gives rise to a technique known as interferometry. Simply put, it allows two or more dish antennas to be placed widely apart or in arrays (such as the VLA "Very Large Array" in New Mexico) to function as if they were one large antenna (Aperture Synthesis). The interference between the signals of each of the receiving antennas, when timing corrections are introduced, allows for image reconstruction using Fourier Transforms. We can now get the resolution of a 2 km antenna by placing several antennas 2 km apart and correlating the data. Using this technique, it is possible to obtain milliarcsecond resolution. A milliarcsecond is roughly the equivalent of seeing a quarter in New York from Los Angeles! With the advent of DSP (Digital Signal Processing), faster and smaller computers, and the introduction of super conducting amplifiers, radio astronomy has progressed at a breakneck pace. New arrays of antennas are being designed and built. Some contain over a thousand individual antennas all operating in harmony, giving resolutions that rival optical telescopes. Other arrays cover a hectare, and one in process covers a square kilometer as a "phased array", giving imaging capabilities not experienced before. The future for radio astronomy looks brighter than ever. To read the second article in this series: second radio astronomy article.